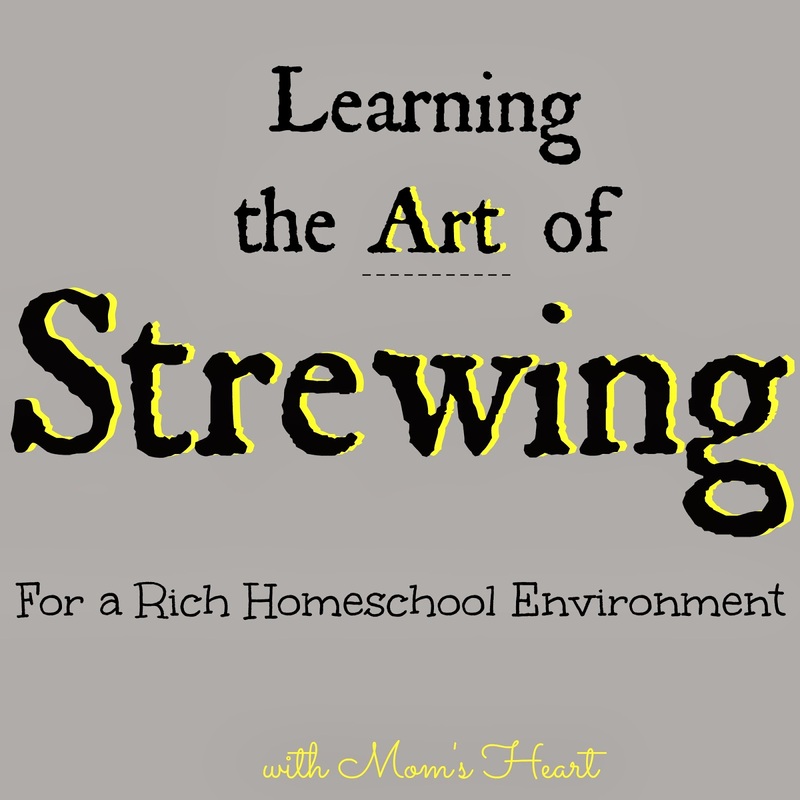 I've always done something similar to strewing, but I never knew it had a term, nor did I realize it was a common practice in homeschooling, especially the unschooling community. We fall more under the umbrella of relaxed homeschoolers, and one of the reasons we are relaxed is because I want to leave plenty of time and opportunity for the children to discover their own interests. Strewing allows me to provide a rich environment and find new ways to spark their interests and encourage rabbit trails; without the pressure of a curriculum or a scope and sequence. This post contains affiliate links for products we use and recommend. 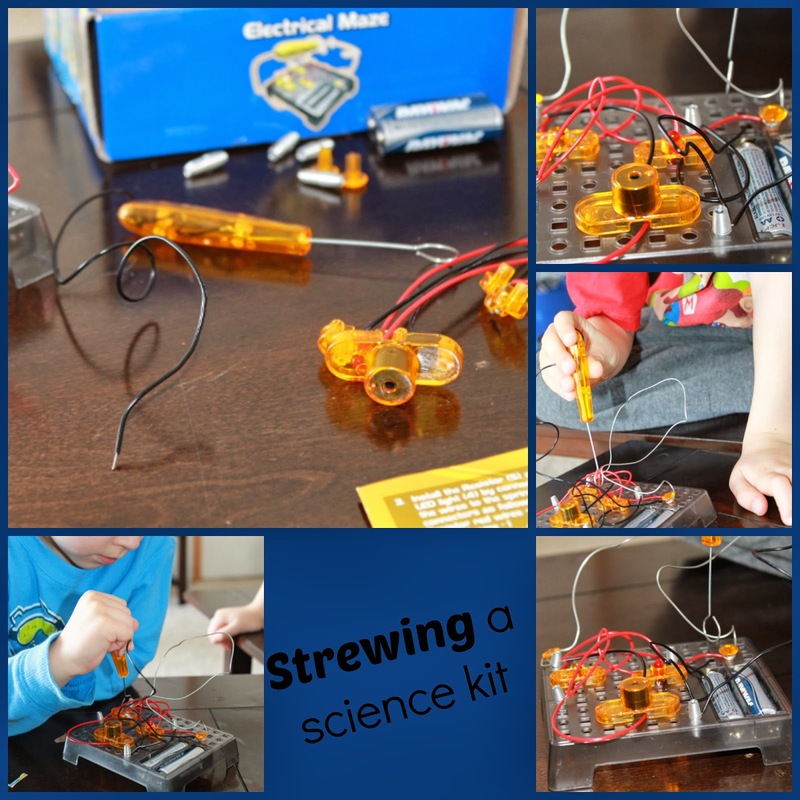 So while I am not quite an unschooler, I can certainly appreciate the idea of strewing as I learn more about it. From my understanding, strewing was coined by unschooling advocate Sandra Dodd, and is simply the act of placing items of interest in the paths of our children so they may discover and pursue it as they wish. The things we strew are not to be forced, and we should have no expectations from our children about when, how or even if they use or enjoy it. The "things" we strew can be anything from an interesting book, to a puzzle, to a website, to new art supplies, to a game, to an experience. Anything really. Just leave it in their path, offer it, and allow them to explore it whenever they are ready. They may not find any interest in it, but at least I have tried. One of the most obvious, I suppose. I've found there are many ways to strew books. Another easy, obvious one. I've set out things like Wrap-Ups and Pattern Blocks and Hot Dots. I like to set out things that can be investigated independently whenever possible. Then sometimes I go off current interests. Recently Elliott chose to learn about energy sources in science, and was particularly interested in electricity. I remembered this Electrical Maze that I picked up at a sale (still brand new) for $1 awhile ago, and I set it out on the counter. I did have to help assemble it, but we had a great discussion and the boys loved trying to beat the maze so they didn't set the buzzer off! This also led to me asking if I should read aloud the book Benjamin Franklin and Elliott eagerly agreed. Even Emory followed along for most of it! When I'm going through the closet and find a game we haven't played in awhile, I'll set it out to be noticed. Sometimes it goes back without any play, and other times it is requested right away. Recently I came across Math Dice Jr. that I bought a couple years ago. Somehow it got packed away. Elliott loves math, and he loves dice games, so I knew this one would be appreciated. I left it out on the table next to some video games. Ignore the scratches on my poor end table. It has had a lot of LEGO Love. Within a few minutes he had stopped playing video games and asked to play this. We've played it numerous times and there are a lot of variations to this game so it has a lot of mileage. Sometimes I strew items unintentionally. When the Draw Write Now set first arrived, I left the box in the floor. Elliott came through, found a 'magna doodle' type drawing toy and started drawing the farm animals from the book. Another time I had a basket of art supplies sitting out from when I was planning my co-op lesson, and Emory asked if he could paint. Absolutely! The boys painted people, volcanoes, and a bowling scene, to name just a few things, and narrated everything to me when I asked about their work. This is easy to do with Pandora. I will just play various channels in the background while the kids play. Since I'm not good at organizing composer studies or other formal music appreciation activities, this still allows us to enjoy exposure to a variety of genres. Sometimes we find something interesting and point it out to the kids, like the bugs I mentioned my husband bringing home in when nature study just happens. Or a simple bird's nest leads to a lot of questions about how birds build their nests and the materials they use. I add new apps all the time, especially when I find free educational apps. Sometimes I will tell the boys, and sometimes I hear "Oh, what's this?" and they explore it on their own. Elliott particularly likes the apps produced by Blake Learning, as they are associated with the online program Reading Eggs that he uses. This is something we've been doing more of lately. We both tend to take the boys on errands with us, encouraging questions as we go. Sometimes we ask the kids if they want to attend special events or classes, and sometimes we plan special experiences for them. Most recently, we planned a trip based on their love of LEGO to the Legloland Florida amusement park. I shared about that in LEGO Field Trip Planning and how it has allowed Elliott especially to rabbit trail into other activities that could easily be categorized under language arts and geography. So while we continuously alter our environment to meet the needs of the kids, I am learning more about the art of strewing and how to use it to challenge them and help them grow. This post is linked up to Blogging through the Alphabet and Homeschool Link-Up. I've never heard the term "strewing" before, but after reading your post, I guess I do that too :) Although, it is something I think I should be doing more of. Thanks for sharing your ideas! The term "strewing" is newer to me too, but since learning more about it, I am becoming more intentional! Yes, strewing has taken us on many interesting rabbit trails. It also helps me discover what my children are and are NOT interested in. Awesome posts. I love your strewing ideas! I am not an unschooler, but first heard of strewing through Homeschooling Momma. I know she does it a lot. These are excellent ideas. Thanks so much for linking up with us at the #homeschoollinkup! Now see, I have heard the term "strewing" before, but it was usually used in a negative manner because my mother didn't like the fact that we were strewing our things all over the place. Perhaps it is a term used more in England and not as common around here. Now, to hear it used the way it is being used here, I love the idea. We are not unschoolers, we do use a curriculum, but even then there could be great benefits in this. Though, I would have to get myself to be calm and not expect them to use the items. Thanks for sharing on Throwback Thursday Blog-Style. Just wanted to let you know that your post was randomly selected as this week's featured post. I hope you are able to stop by and share again this week. Thanks for joining in.